Strong dollars in Canada and Australia, as well as wealth in China and Korea, are turning a year of good inbound numbers from mainland U.S. into a stellar one for the islands. University of Hawaii economists are predicting Hawaii’s economy will grow 2.4 percent next year as more tourists visit the islands and the travelers who come spend more. 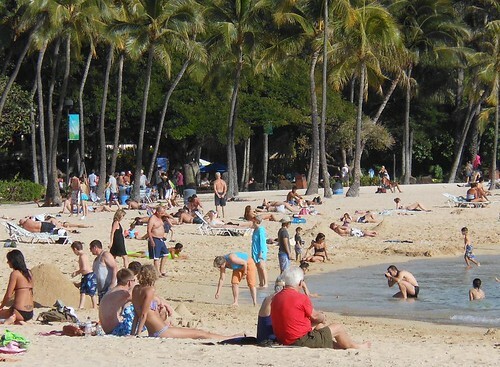 Beach scene in Honolulu, Hawaii. Photo by Michael Coghlan. “The tourism industry is on a tear, posting impressive rates of growth. With a few exceptions, the rest of the local economy is going nowhere,” the university’s Economic Research Organization, or UHERO, said in a report Friday. More travelers from Canada and Australia — both economies benefiting from high commodity prices — are visiting the islands, along with U.S. mainland tourists who held back on travel during the recent recession. There are also more travelers from China and South Korea — both countries that hadn’t sent that many tourists to Hawaii in the past. The economists estimate visitor arrivals will grow 3 percent next year while spending should climb 8 percent in 2013. The forecast comes after the Hawaii Tourism Authority said Thursday that the industry is on course to break records this year. It said 3.9 million visitors arrived in the islands during the first six months of 2012 — up 10.2 percent from the first half of 2011. The travelers spent $7.1 billion from January through June, up 21 percent. The UHERO report predicts that the construction sector will pick up in 2013 as residential building grows and the state spends more money on public projects. It estimates construction jobs will grow more than 9 percent next year after staying almost flat this year and declining 2 percent last year. Uncertainty about federal spending is one potential trouble spot for Hawaii, as is a dramatic worsening of European economic conditions. The report notes tax cuts enacted under former President George W. Bush are set to expire Jan. 1, along with a temporary payroll tax holiday and extended unemployment benefits. Add to that large spending cuts Congress agreed to last year as part of a deal to raise the debt ceiling. Altogether, this could subtract four percentage points from the nation’s gross domestic product, the report said, citing the Congressional Budget Office.